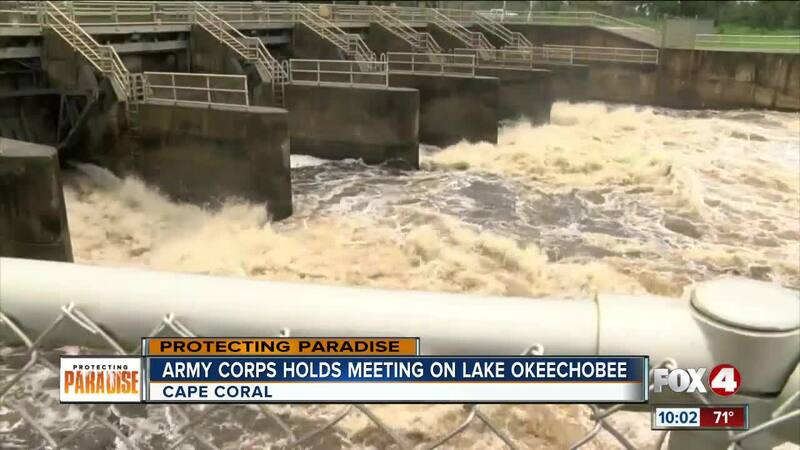 CAPE CORAL, Fla. -- The U.S. Army Corps of Engineers, which controls the water releases from Lake Okeechobee, heard directly from residents Tuesday tonight at a feedback meeting held in a Cape Coral church. The City of Cape Coral invited the U.S. Army Corps of Engineers to discuss water management. The event was a crash course in the history go Lake Okeechobee; topics included monitoring, project updates, and policy solutions. But those who spoke say that while solutions and projects flow throughout their organizations, it’s the community involvement that they need the most. Captains for Clean Water, an organization that’s championed efforts for water quality and management, told audience members that the attention towards Lake Okeechobee comes from the active community and they encourage others get involved. “It’s not just the fishing guys. It’s the realtors, it’s the businesses, and they’ve banned together to get this problem fixed,” said Daniel Andrews. Policy plays a major role in the future of water quality. Mayor Coviello says Governor Ron Desantis is off to a good start. “Governor Desantis hit the ground running. When he changed over that entire water management district board, he appointed people that will have the coastal communities best interest at heart,” he said. Attendees were able to meet with the speakers after the session.